In support of this goal, the MSC administration acquired a 129-project alternative energy experimental kit for use of the students. The information campaign will be mainly though the club’s planned website. The club may organize some seminars in the nearby communities. The windmill uses magnetism to change the mechanical energy of the spinning shaft into electricity. The voltage it produces is usually lower than the solar cell, but the current is higher. Your solar cell makes electricity from sunlight, but only a small amount. In bright sunlight it produces a voltage of about 7V, but this is reduced when lots of current is flowing. That is why the voltage drops when you connect the yellow LED. The 470μF capacitor (C5) is used here to improve sound quality by helping to stabilize the battery voltage. The radio needs a steady voltage to produce good sound quality, but the current it needs changes slightly as the sound changes. The capacitor can only supply a small amount of current but can react to changes faster than the battery can. Remove the capacitor from the circuit and see if you notice a difference in sound quality. The most powerful power source is the one which produces the best balance of voltage and current. 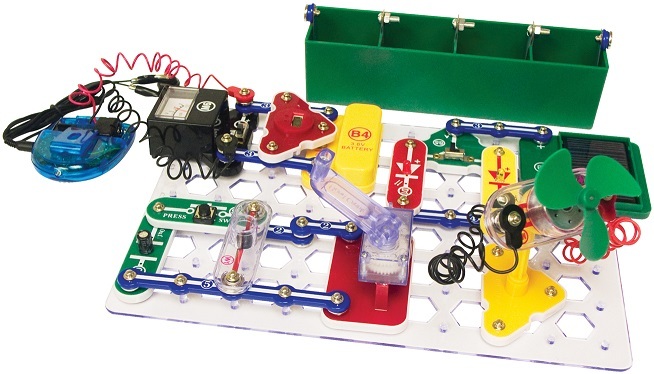 Different types of circuits need different levels of voltage and current. For each power source, the balance between voltage and current produced can be adjusted by changing its construction or with how groups of them are arranged. The red and yellow LEDs (D1 & D5) are used here to keep the different power sources from interfering with each other, by controlling the direction electricity flows. Pure water has very high resistance because its electrons are tightly held in place. Impurities (such as dissolved dirt, minerals, or salt) decrease the resistance because they have loose electrons, which disrupt the structure and make it easier for other electrons to move through. This entry was posted in High School, News and tagged aedes mosquito, alternative energy, Chikungunya, cocolisap, dengue, MSC Science Club, science club, snap circuits on July 2, 2014 by mscadmin. Sa MSC Caregiving Course – pay 50% later! Para sa mga naninirahan sa barangay ng San Gabriel, San Miguel, at mga karatig na mga barangay na nais mag-aral ng Caregiving, maari nang mag-enrol na kalahati lamang ang babayaran. Ang matitirang kalahati ay babayaran kapag nakakuha na ng trabaho. Ito ang pahayag ni G. Ike Prudente sa pag-balik niya at kanyang pamilya sa San Gabriel na tahanan nila noong 70’s at 80’s. Kasama nila sa paglipat sa San Gabriel ang buong paaralan ng VYP-MSC Institute of Technology, kabilang na ang Caregiving School nito. Para sa iba pang mga detalye ay magtungo lamang sa MSC. This entry was posted in College, Courses, News on May 23, 2013 by Veronica Prudente. Abril 2012 nang lumipat ang buong VYP-MSC Institute of Technology sa Barangay San Gabriel, San Pablo City. Ngayon ay napakalawak at napakamaaliwalas na ang paligid ng mga mag-aaral dahil sa malalaking puno at magagandang halaman sa loob at paligid ng paaralan. Magandang balita rin ito para sa mga naninirahan dito at sa mga katabing lugar dahil sa mayroon nang malapit at de kalidad na paaralang pwedeng pasukan nang mga batang taga rito. Maaari nang makapagtapos ng kursong Bookkeeping, Programming, at Computer Hardware Sevicing (o Computer Technician) sa napakababang halagang maaring umabot lamang nang walong libong piso. Ito ay dahil sa diskwentong maaring umabot hanggang 40%. Bukod pa sa napakababang bayarin ay maari ding matapos ang isang kurso sa loob lamang ng isang semestre o apat na buwan! Kaya’t ang mga kursong iniaalok ng MSC ay maaaring matapos ng wala pang dalawang taon. Dahil dito ay ilang uri ng trabaho ang naghihintay sa kanya sa panahong makapagtapos siya sa MSC. This entry was posted in College, News on May 23, 2013 by Veronica Prudente. Yes you read it right, MSC has four libraries! The main library contains general information and reference books for high school and tech-voc courses. Several Internet-enabled computers are also in the library for research and email. A “science library corner” which contains Science and Robotics books is found in the science lab. while a similar “computer science library” which contains reference boks on programming, hardware servicing, and miscellaneous software is located at the computer lab. The newest is a 40 sq. m. “Silid Booklatan”, a joint project of Booklat Isip Inc., Kiwanis Club-Buklod San Pablo, United Architects of the Phils. – UP Diliman Chapter, and MSC. Located near the main entrance of the school, its holdings range from nursery and children’s books, mystery and action novels, magazines, and hi-tech trade books. Silid Booklatan aims to develop the habit of reading among community members, especially the youth that is why it is open to the public. So if you happen to pass by MSC, do not hesitate to come and read some books at Silid Booklatan. This entry was posted in College, Courses, Events, High School, News on May 23, 2013 by Veronica Prudente. Nagwagi si James Patrick Maghirang, mag-aaral ng MSC High School ng 3rd Place sa ICT-PC Assembly with Configuration and Networking sa nakaraang Regional Festival of Talents (Technolympics) na ginanap sa Nasugbu, Batangas noong Enero 14 – 18, 2013. Si James ay kasalukuyang nasa 3rd year high school sa MSC at isa siya sa dalawang natatanging kalahok na nagwagi galing sa San Pablo City Division. Ang MSC High School ang napili nang pamunuan ng San Pablo City Division ng Dep. Ed. na kumatawan sa division at lumahok sa paligsahan sa ICT-Tarpaulin Design, ICT-PC Assembly with Configuration and Networking at ICT-Webpage Design at hindi naman sila nabigo sa pagtitiwalang kanilang ibinigay dahil sa galing ng mga mag-aaral na galing sa MSC lalo na sa larangan ng ICT (Information and Communications Technology)! This entry was posted in Events, High School, News on May 23, 2013 by Veronica Prudente. With implementation of DepEd’s K to 12 curriculum, VYP-MSC is one of the few schools which is better prepared for the transition. Having a high school department and operating a Tech-Voc department at the same time, is ideal for the adaptation of the K to 12 program. This is because the school already has the resources and personnel for the additional two years of high school (Senior High). Very little adjustments would be necessary for the execution of the program. For schools who operate a high school only, they need to do a lot more work to comply with the new set up. Some opt to partner with Tech-Voc schools and colleges or universities. But for MSC, that is not necessary.